When, in 1911, the Department of Militia & Defence (M&D) ordered the transition from the white Universal helmet to the white Wolseley pattern helmet they permitted existing pugarees to continue to be worn. This satisfied the need for regimental identities for most orders of dress. However, the 1904 introduction of drab Service Dress called for either a khaki cover to the helmet or a khaki helmet left the Militia with little opportunity for regimental expression. Plain Wolesley helmet, dated 1913 and marked with the Canadian C/Arrow property mark. 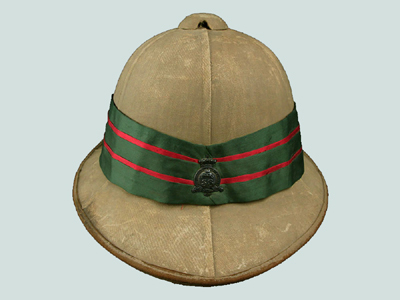 Although most khaki helmets are unadorned photographic evidence shows that some regiments adopted a regimental flash for the khaki helmet prior to the First World War. This practice only received official sanction in 1935 following British practice where, in 1934, Dress Regulations permitted the use of flashes or other embellishments on the Wolseley. The adornment could be worn either directly on the helmet or on the khaki cover to the white helmet. Unit flashes sewn to the khaki cover. Left, 2nd Divisonal Canadian Engineers, ca. 1930. 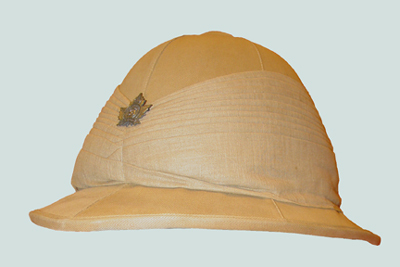 A khaki Wolesley helmet with an extravagant pugaree and the badge of the 38th Battalion, later the Cameron Highlanders of Ottawa. – Badge – a regimental badge, placed either on the side or on the front. – Embellishment – typically a plume or hackle. Three examples of helmets displaying flashes only. Left, Hastings and Prince Edward Regtiment, ca. 1940. Centre, Royal Canadian Engineers, ca. 1938. 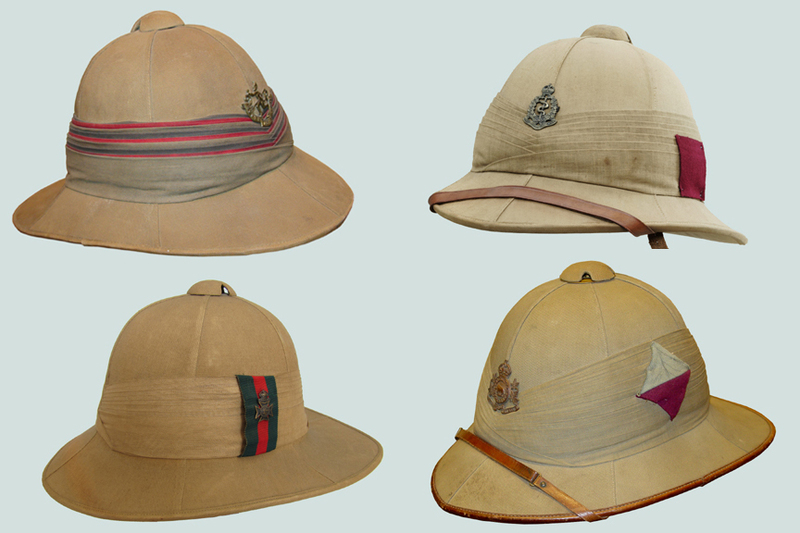 Two Second World War examples of helmets with ’embellishments’. Both of these were approved in the 1943 War Dress Regulations. Left, Royal Highlanders of Canada (Black Watch). Right, Governor General’s Foot Guards. 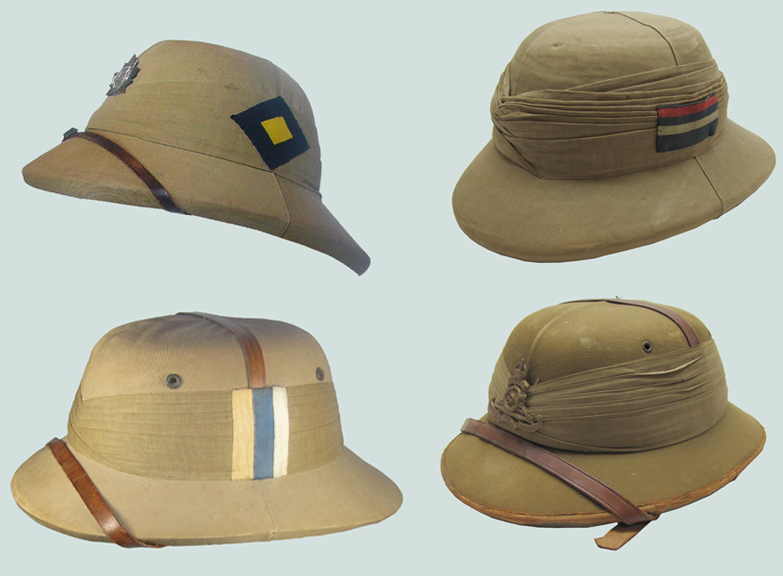 Khaki helmets, when adorned, will often use one or two of the above although examples exist where three elements are incorporated. The author has yet to find an example where all four elements have been used on a single helmet. Four styles of helmets displaying multiple adornments. Top row, left, Royal Winnipeg Rifles. Right, Royal Canadian Army Medical Corps. Bottom row, left, Victoria Rifles of Canada. The challenge to collectors is the identification of many flashes. Although headquarters’ approval was required no central files were kept and details can only sometimes be found in individual unit records. In lieu of the approved Wolseley pattern helmet, officers also purchased a Cawnpore-style helmet. Examples show that this pattern helmet often included a badge placed at the front whie others include a flash. 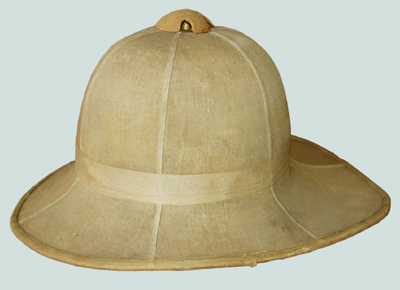 In addition to the Wolseley pattern helmets, many officers procured Cawnpore-style sun helmets. Top row, left, Fort Garry Horse. Bottom row, left, Royal Canadian Army Service Corps. By the mid-1940s the khaki helmet was no longer in wear. Very good, interesting and factual informations on a little known subject.Kudos to the author.